Roger Goodell, NFL collusion: On further review, the commissioner butchered this season from end to end. On further review, Roger Goodell butchered this season from end to end. 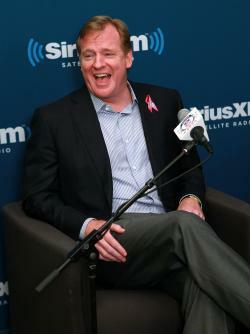 NFL Commissioner Roger Goodell attends SiriusXM Town Hall at SIRIUS XM Studio on October 22, 2012 in New York City. Cowboys-Redskins was the biggest matchup of the year, a win-or-go-home game for two division rivals. It turned out to be the most-watched regular-season sporting event in 15 years. But one familiar face was missing from the FedEx Field suites: commissioner Roger Goodell, who found something else to do Sunday night. Maybe he was busy. Or maybe he knew he wasn’t exactly welcome at a game featuring two of the teams he penalized—to the tune of tens of millions of dollars—for the crime of not colluding to hold down player salaries. Dan Snyder and Jerry Jones didn’t listen, choosing to ignore the rule that didn’t exist. They did what any team facing an uncapped year ought to do—they staggered their contracts and signing bonuses to pile up in 2010, to save themselves cap space in future seasons. Every team did this, and four exceeded the secret $123 million cap. But the Redskins and Cowboys did it so egregiously, the other owners decided to come down hard on them for not honoring the conspiracy. Washington was docked $36 million and Dallas $10 million in future cap space, to be forfeited in 2012 and 2013. To make this palatable to the players, who after all were the victims of a backroom deal to deny them fair market value, the NFL agreed to distribute the cap space to the other teams. The NFLPA agreed, as part of signing the new collective bargaining agreement last year, to forego litigation on the matter. NFL owners voted unanimously to levy penalties against two of their highest-spending colleagues. Snyder’s and Jones’ appeal was thrown out by the NFL’s rubber-stamp arbitrator. A last-second, hail-mary NFLPA lawsuit followed. Washington and Dallas came into this season at a competitive disadvantage to every other team—the Redskins’ handicap nearly four times as large as the Cowboys’—but it didn’t seem to matter. There, in the last game of the regular season, were the two franchises that had refused to march in lockstep, fighting for the division. With the NFL’s secretive and complex contracts, it’s nearly impossible to tell how hamstrung they really were by the penalties. Or even, intriguingly, if loading up their cap hits in 2010 allowed them more flexibility in 2012, even with the forfeited money. For example, Pro Bowl special teamer Lorenzo Alexander’s front-loaded contract carries a cap hit of just $700,000 for Washington this year. This division title might also have been impossible without the rookie wage scale, a major victory won by the league in the last CBA. The Rams have been crippled by Sam Bradford’s $78 million deal, while the Redskins have Robert Griffin III for four years and $21 million, plus a team option for a fifth. This sort of added flexibility is what Goodell and the owners wanted, and now they have to watch it benefit a team they tried to straitjacket. Don’t feel too bad for the commissioner. Early this morning, less than 12 hours after two rogue teams embarrassed Goodell by playing for the NFC East, a federal judge in Minnesota issued a ruling. The NFLPA’s collusion lawsuit against the league was tossed out, with usually pro-player judge David Doty agreeing that the union had forfeited its right to sue under the collective bargaining agreement. The Redskins may have made the playoffs, but Roger Goodell still won the Collusion Bowl. That was the season in “competitive balance,” the catch-all invoked anytime the commissioner wants to make an executive decision. But this year, even that has taken a backseat to “player safety,” an oxymoronic concept that threatens to be the NFL’s single biggest source of bad PR. So it was very poor timing for the New Orleans Saints when a disgruntled former employee approached the league with a story: The defense had run an organized bounty ring, in which opposing players were specifically targeted and the Saint making the injurious blow would get paid if the player was carted off. Nearly everything in that last sentence turned out to be false or unsupported, but that didn’t bother the commissioner. 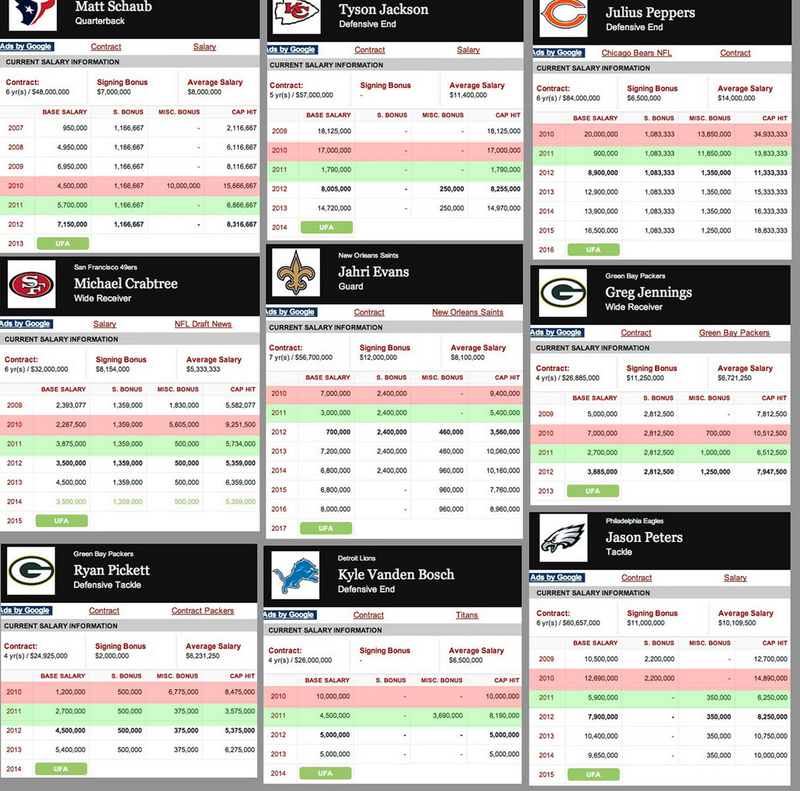 Suspensions, fines, docked draft picks all around. And when an appeals panel ruled that Goodell had overstepped his own authority in handing out suspensions, he simply nodded, smiled, and suspended them again. That these suspensions were eventually thrown out (“the NFL’s decision … certainly raises significant issues regarding inconsistent treatment,” wrote former commissioner Paul Tagliabue) didn’t particularly matter. The damage had long been done. The Saints lost their coach for a full season, and their interim coach for six weeks. They lost their GM and some draft picks and followed up a 13-3 season by going 7-9. The Rams lost their defensive coordinator. Anthony Hargrove spent the year as a free agent, with teams scared off by the lengthy suspension hanging over his head. There wasn’t a team untouched by Goodell’s heavy hand in 2012. The senseless referee lockout, the commissioner’s ideological war, rendered three full weeks of the NFL season suspect, with real consequences. If a banker who flunked out of college ref camp hadn’t signaled touchdown when there wasn’t a touchdown, the Packers would be enjoying their playoff bye week right now. All year, Goodell sowed chaos in the name of protecting the league from chaos. It’s a testament to the NFL’s dominance that it’s able to survive its own boss.